In 1906, when painter Robert Eugene Otto was six years old, his family's Bahamian servant (some say slave) gave him a special present. It was a doll crafted in the boy's likeness, and she'd even given it the name Robert. Throughout Otto's childhood, he showed an unusual attachment to Robert the Doll. And whenever strange things happened around the house, Otto always claimed they were Robert's doing. As an adult, Otto built a special room for Robert in the attic of his home, complete with scaled-down furniture and lowered ceilings. No one was allowed to visit the room. Yet according to Wikipedia, "children on their way home from school claim that they would see Robert move around in the upstairs windows even when no one was home." But the fun didn't really begin until after Otto's death. His will required that Robert be left in peace, so when Otto's wife rented their old house, she allowed Robert to stay in the attic. Renters often claimed to hear footsteps and laughter coming from upstairs. Occasionally, they'd check on the doll, only to find that he'd changed positions. "I was doing some work in the [attic]. . . . The doll looked pretty creepy sitting there on the little chair holding its stuffed animal, but I had work to do so I didn't think much about it at first. As my work continued I had to make a few trips to get some parts from the van. Each time I returned I could swear the doll had moved a little bit. Like I said, I had work to do so I ignored it as much as I could, but when I was just about finished with the job and started descending the stairs, I heard a little kid giggling behind me. When I turned around the doll was on the opposite side of the room. The first thing I did was look to see where the kid was, but no one was there. I wasn't really frightened, but it was weird so I just continued down stairs and left. Some of my tools are probably still up there." Today, Robert is in the East Martello Museum in Key West, Florida. Museum employees claim that he's still up to his old tricks. Check out the video below and see what you think! Creepy! i'm a believer in ghosts but idk about this! Ahhh, demonic dolls... I hate porcelain dolls, because they just creep me out. I can't walk past the one inmy room without feeling like its following me with its eyes. that is such a freaky little doll. When I went to key west I saw him. i thought oh yah haunted doll, I had this really cool new digital camera with really good focus. I focused it really well on the doll and took the picture, it was super blurry, i tried again and again but the pictures just wouldn't come out, It was freaky!!! its like a non-killer chuckie!!!!!!!!!!!!!!!!!!!!!! As long as his tricks don't kill I'm fine with him. O.O That is freaky! THis sort of reminds me of Chucky, even though I have never seen that movie! Very, very scary! Giggling children is about the scariest sound there is! In another documentary about him, the narrator says that Robert's hair is becoming white, and that his facial expression changes in front of visitors' eyes! That is eerie. Especially since my two best friends both have second homes. One has a house in the keys. and the other has a cabin with a SUPER freaky porcelain doll in it. Trust me it is one scary doll, because I used to collect dolls. Creepy. Eerie. Mildly disturbing, and all that jazz. Boy was i wrong! The doll is creepy. Sound's like the cliche of an evil doll. What's on his face? It looks like he either had a serious pimple problem or was hit by flying glass. I'd like to see him, though. And some of the music they used was soooo creepy-cool. ......If they cant take pictures how are they abel to take the picture thats on the post? Sorry, I now realize my last comment may have been a little insensitive, if that's the word I want. Hope I haven't upset anybody in any way. I think this is so true! it's creepy though. I have two porceilen (ditto on spelling) dolls, but I think that one was wooden... COOL though! I love ghost stories, haunted places stuff like that..... whyyyyy do my doors ooooooppppen randomly??? type stuff. actually, that is a question I would like answered. Falcon: A lot of times, if the doors are made of wood, when the temperture (spelling) changes, the wood will contract or expand, making it not fit in the doorway. This will often cause it to open and close. Especially in old houses. 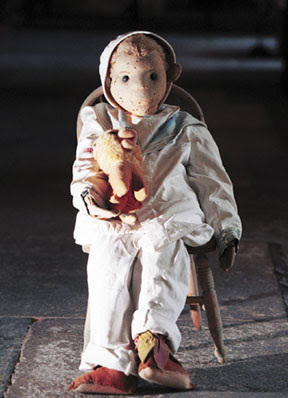 This doll is more then just CREEPY!!!!! I don't think I ever want to end up at Key West... I do believe in things like this. The doll is just abnormal! liltomboyblue11;):I am now very curious about the Molly doll story. You should send the story to Ananka and have her post it. that is so freaky i heard the story and i couldnt sleep at all...........i also heard that if u dont introduce urself to him hell haunt until u do.......... FREAKY!!!!!! AWESOME!!! i was in the keys acouple weeks ago, i shoulda gone. but, alas, i did not know yet of robert. there are a couple of mocking ghost children in my house. i cant see them, but they are there. trust me, they are constantley (?) pulling pranks on me. but, my bedroom door used to open randomly, but then (get this, turns out they're nice) i asked them to open the door when they come in my room, leave it open, then shut it when they leave, AND IT WORKED!!! now i will be laying in bed reading, and my door will open, then 5 or 10 or 20 minutes later it will close! thank you, ghost children!!! although the spare room in our basement freaks me out. (i call it the mushroom room cause there used to be mushrooms, but i really think that there is a third (semi-evil) ghost child whos bedroom used to be there.) CREEPY!!!! I agree with Cassie! I wanna remove his hat and try to take a picture of him. I "visited" Robert today after hearing his story on a ghost walk tour. I asked his permission to take his picture (feeling foolish) and got 3 very good pics. I then thanked him. LOL! My camera is just fine. OMG thi sis so creepy i was trying to read all the comments and my computer kept on shutting down but it eventually turned on and stayed on. WANDER IF HE IS HAUNTING ME? !